The government has started ART services for PLHIV communities from its health facilities from October 2017. At present a total of 6 (six) government hospitals across the country are providing the services. 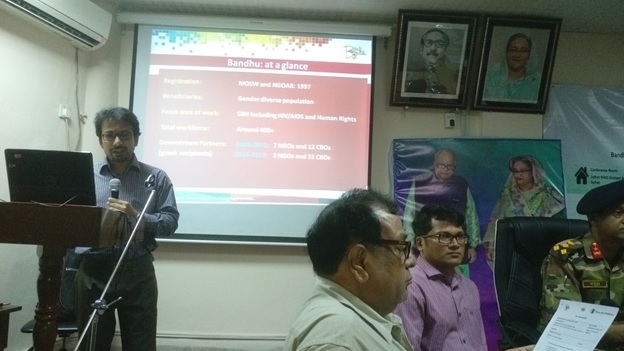 Health access into government hospitals for gender diversified people in Bangladesh is a big challenge due to non-tolerant socio-cultural perspectives towards same gender relationships. To create stigma & discrimination free environment and increase awareness on health and health rights issues of gender diverse communities, Bandhu has been conducting a number of sensitizing sessions involving AIDS STD Program of Directorate General of Health Services (DGHS) for doctors and other government health service providers so that the PLHIV communities, especially MSM and TG clusters of Bandhu’s “Sparsho” members can get stigma and discrimination free ATR services from government health facilities. As a part of this, Bandhu jointly with AIDS/STD Program (ASP) organized a training program during 11-13 March 2018 where a total of 25 Government Health Service Providers of Sylhet Medical College and Civil Surgeon office participated. Mr. Fosiul Ahsan, Director-Program of Bandhu welcomed the participants and underlined that ensuring stigma and discrimination free medical services are essential to reduce the burden of HIV and for this, Bandhu has taken initiatives to introduce this training package to the government doctors who are working at different district hospitals under Civil Surgeon offices. Dr. Fuad Ahmed, Deputy Program Manager (DPM), ASP requested the participants to enhance their Knowledge and information throughout the training and utilize in their profesional life. 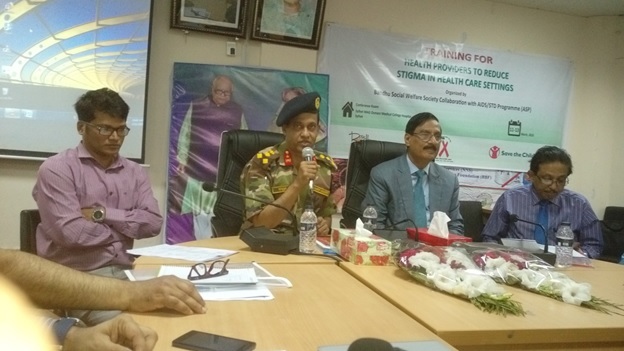 Brigadier General Dr. A K Mahabubul Hoque, Director Sylhet MAG Osmani Medical College Hospital was there as Chair of the event and Dr. Ehtesamul Hoq Chowdhury Dulal, President BMA and Ex ADG, DGHS graced the event as Chief Guest . After a formal innauguration of the training, the main discussion was started with the speech of Ban-Ki-Moon, Ex Secretery General, UN.